Mantels and surrounds are the ideal fireplace accessory to make the fire stand out and provide a stunning focal point for any room in the house. A fireplace mantel is an easy way to install style and character to a room, as well as being entirely practical by giving you much-needed shelf space. With a range of styles from modern and minimalist to intricate and elegant, there is a mantel and surround to suit every fireplace. 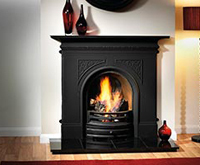 At Cast Fireplaces, we offer a variety of fireplace mantels and surrounds in a range of different materials to suit every fireplace, style, and home. 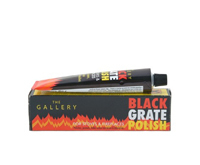 In many cases, we provide bespoke sizes to make sure you have the right fit for your fireplace. Manufactured from 100% solid Agean Limestone in traditional and modern designs, perfectly suited for fireplaces and stoves. 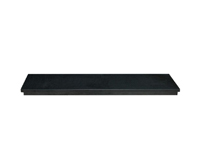 Available in sizes from 42" to 60", we have stock for every size of chimney breast. Solid wood with a natural finish, offered in American Oak and Pine handmade and hand finished, we are proud of the range we produce. Bespoke sizes are available from us in most of our surrounds. Carrara marble in grand designs, designed for the larger chimney these marble mantels offer the feel of a traditional Victorian fireplace without the cost of buying an original. 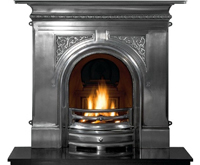 The ever popular Palmerston fire range offer a quality cast iron fire surround to frame a fireplace or stove. It has a rebate, so slips are required if using with a stove. 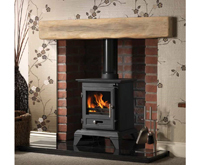 What is more authentic looking than a wooden beam above a roaring stove? Beams are solid oak and Geocast for a real wood look. These are essentially concrete beams designed to look like oak but can sit close to the fire as they're non-combustible. Stone fireplaces such as limestone or marble can create a stylish and sophisticated look that is utterly timeless. Providing a natural feel, stone fireplace surrounds are aesthetically pleasing and extremely versatile. With a range of natural colours, stone mantels suit a wide variety of décor and interior design trends. Limestone is great for adding a light and airy feel to your home, while the luxury of marble gives an elegant appeal. Wooden fireplace mantels. 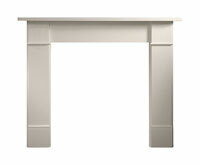 For a homely and cosy look, a timber fireplace surround offers a chic country cottage appeal. Earthy wooden colours can be warming, adding a stylish touch to a range of colours and décor. With a range of wood types from American Oak and Pine, Cast Fireplace customers can find a variety of wooden mantels to suit their home with bespoke sizes to get the correct mantel to suit the fireplace. To save space, Cast Fireplaces also offer floating wooden fireplace beams to give an authentic fireplace look and adding valuable mantelpiece shelf space. Adding character and drama, cast iron fireplaces are ideal for Victorian style fireplaces and to provide period character to homes. With a bold black finish or fully-polished option, cast iron is an excellent mantel material for style and making sure your fireplace attracts attention.